PASSENGER RAIL IS AT A CROSSROADS, and what unfold over the next year or two may determine it's final fate in the region, as well as the continent. Recently Amtrak head honcho David Gunn, a man who is not known for deception, delivered an ultimatum: all trains introduced under the auspices of partial state funding must become fully state funded over the next 2-5 years, or face cancellation. In many parts of the country, where such a target is distant, there was outcry. And yet his goal is understandable; every dollar the state does not kick in, is a dollar beleagured Amtrak must. Put up, or shut up, was the message, and it got through. In the PNW states, as in California, the impact seems less dire. 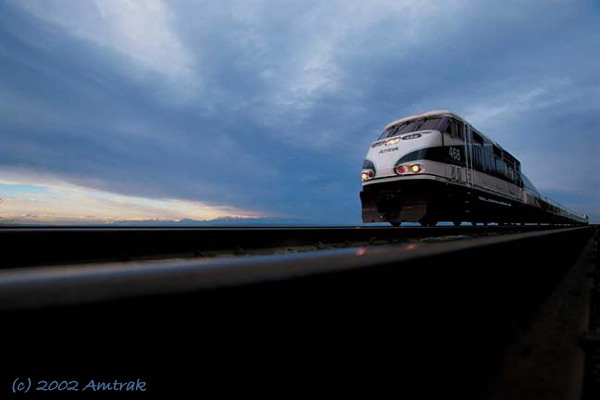 According to the Washington State DOT, Amtrak Cascades service from Portland thru Vancouver, B.C., already brings in 90% of costs through ticket revenue. Kicking in the extra 10% may be tight in today's budgets, but there seems little doubt that these trains, the silent success story of Amtrak, will survive and expand. OREGON IS ANOTHER STORY. It's Portland - Eugene run is under utilized, and the balance has not been adequately funded by the Legislature, too busy protecting other interests in a mutli installment Salem budget brawl. Thus, it's future is in doubt, and the likelihood is that these trains will be cancelled. If so, then good. If Oregonians are not willing to ride these trains then they do not deserve them. Putting them on as a second and third Seattle-Vancouver B.C. run would allow, at long last, Portlandians to access Vancouver in a one day trip, avoiding today's necessary overnight in Seattle. In Canada, things are equally chaotic. BC Rail recently received Parliamentary sanction to cease all passenger operations, (quite possibly to make it a more attractive property to sell.) Rumors abound that VIA may take up where the BCR RDC cars left off, but no action has been taken yet. And on the Esquinault & Nanaimo, passenger service still hangs on by a thread, like a bad episode of Perils of Pauline. YET ALL IS NOT BLEAK. This summer, luxury railcar manufacturer Colorado Railcar began marketing it's DMU, the only such vehicle in North America to meet FRA safety standards. at $2.5 million a car, they aren't dirt cheap, but they're not gold plated either. Like the classic Budd RDC, Colorado Railcar's offering promises low operating costs and, even better, an affordable alternative to electric catenary and dedicated rights-of-way. 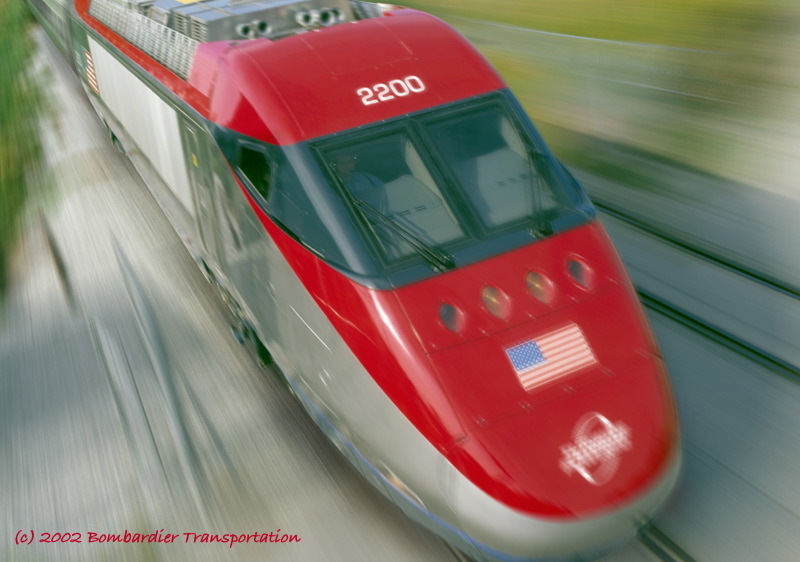 Meanwhile, Bombardier, licking it's wounds from the Acela fiasco, debuted in mid October it's long awaited 'Jet Train', a turbine powered variation on Acela. (No word yet on whether it uses the same yaw damper as it's older, troubled sibling.) Jet train promises to do for medium and long distance trains what Colorado's DMU could do for corridor applications, eliminating costly electrification. It's tilting mechanism allows it to attain speeds of 100 MPH in curves and higher in tangents. One can't help but feel that, at last, power may have been found for Cascades service that actually matches the sleek Spanish Talgo sets, without those quirky flares on the roof. So change is in the air. Policy decisions still must be made in DC and Ottawa, Salem and Victoria. Don't count passenger rail out. Indeed, perhaps, if these trains could speak they would qoute us a little Twain: "The rumors of my death have been greatly exaggerated!"